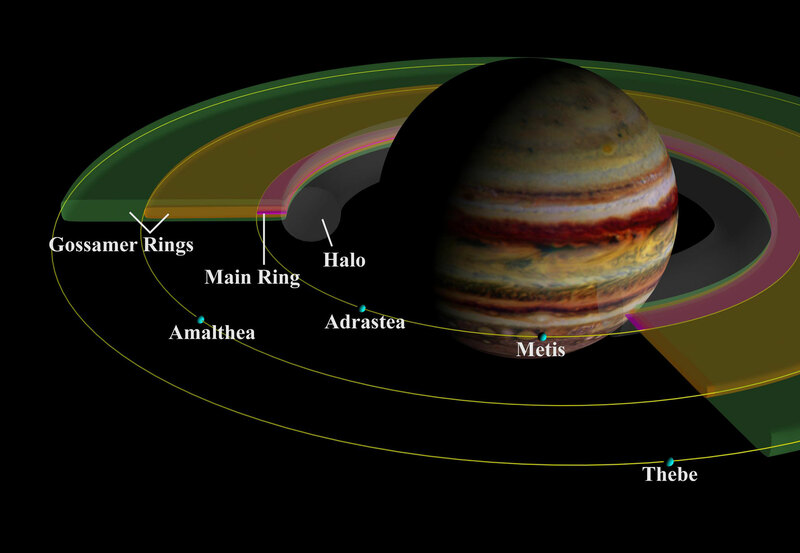 The Jovian system encompasses Jupiter, its rings and moons. Jupiter was reputedly discovered by the Babylonians some 9,000 years ago. Its moons were discovered by Galileo, in 1610, observed through a refracting telescope. • Jupiter is the fifth planet in our Solar System counting out from the Sun. It is 5.2 Astronomical Units away from the Sun, or 5.2 times further away from the Sun than the Earth. • A Jovian year is 11.9 Earth years, but the Jovian day is just 9 hours 55 minutes. • Jupiter has an equatorial radius of about 44,000 miles compared to the Earth’s of just under 4,000 miles, making it 11 times larger than the Earth. It is the largest of the Gas Giants which makes it the biggest planet in the Solar System. Jupiter is so big that it contains more matter than all of the other planets combined. 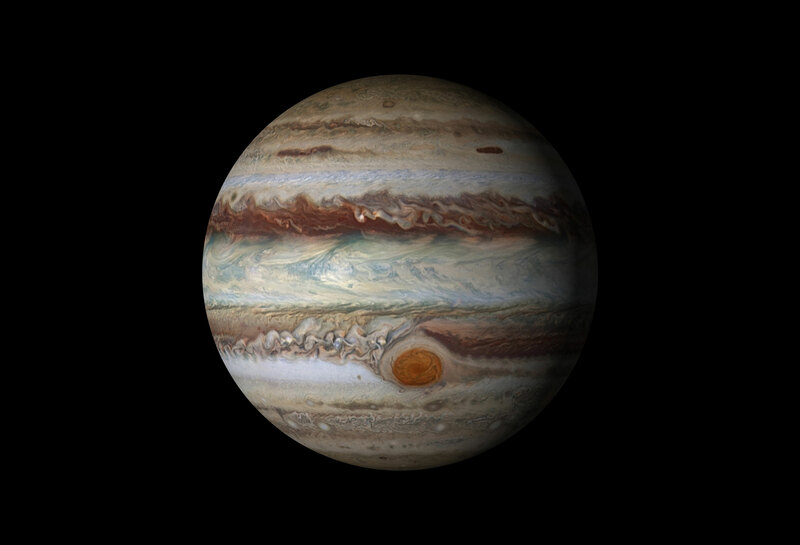 • Jupiter is a Gas Giant, with it’s atmosphere being mainly composed of hydrogen and helium. In this respect it is very similar to the Sun with a mass proportion of around four hydrogen to one helium. • The apparent surface of the planet if formed of gaseous clouds. These clouds are active in a very violent storm system. The storms last very long periods of time as there is no land mass to disperse them. • Little is known about the internal composition of the planet, but it is speculated that it has a small, very dense rock and ice core that is encompassed by dense metallic hydrogen. As it is not possible to see through the clouds the presence of a surface cannot be determined. It is possible that there is no surface and that an object sinking through the atmosphere would just become more and more compressed the lower it went. • As Jupiter is always outside the Earth it is always observed as a disk. Planets closer to the Sun can often be seen as crescents, but planets further from the Sun will always be seen as disks. • In our night skies Jupiter is the third brightest object to be seen. The brighter objects are the Moon and Venus. However when Venus is in crescent it is possible that Jupiter will outshine it. Although Jupiter is a long way away it’s clouds are very reflective. • Jupiter does not have seasons like the Earth as the orbital inclination of the pole is about three degrees so only varies a little throughout the 11.9 year orbit. • The storms present themselves in bands whirling around the orbital plane of the planet. We refer to these as zones and belts. The lighter zones are clouds at a higher altitude and are seen to be cooler in the infrared spectrum. The darker belts are warmer and thought to be lower in the atmosphere. Altogether there are 15 defined areas in Jupiter’s atmosphere which are mirrored in the northern and southern hemispheres. • The most famous feature of the Jovian atmosphere is the storm known as the Great Red Spot. It was documented in 1899 in the Monthly Notices of the Royal Astronomical Society, but there were even earlier scientific observations from H Schwabe in September 1831, and it may well have been observed before that. The Great Red Spot is easy to view in a modern small telescope on a night with good visibility when Jupiter is high in the sky. • Most people think that Jupiter has four moons. They are wrong! There are in fact 67 recognised moons orbiting in the Jovian System. However there are four that are large and easily visible from Earth using a small telescope. • Galileo is credited with discovering the first four main moons hence them being called the Galilean Moons. This initial discovery was made in 1610. 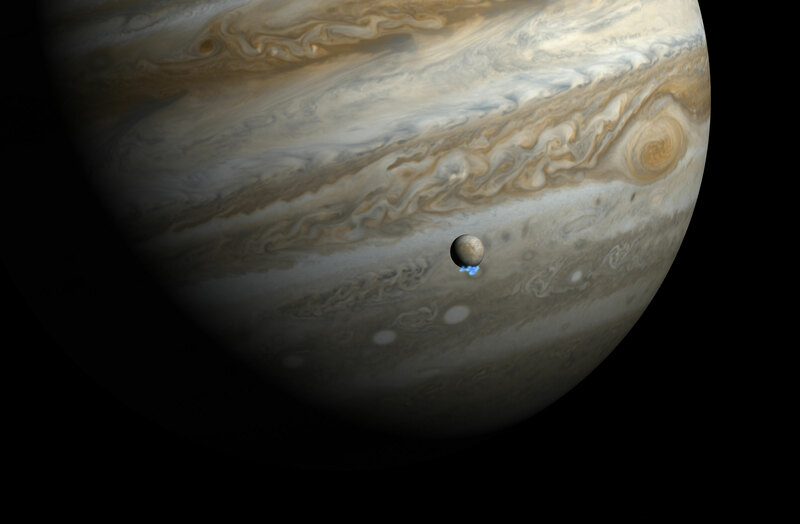 The latest Jovian moon to have been discovered was not long ago in 2011. • The moons of Jupiter are split into two main categories: those with regular orbits and those with irregular orbits. The moons with regular orbits travel round Jupiter in an almost circular orbit aligned with the planet’s equatorial plane. The irregular moons have elliptical orbits, high inclinations and are much further away from Jupiter. • The moons vary dramatically in size from 1km in diameter to over 5,200km. Ganymede is the largest and there are 48 moons with a diameter of 5km or less. • Of the four moons Galileo discovered, Ganymede is the largest, followed by Callisto, Io and Europa. Ganymede is in fact the 9th largest body in the solar system and is bigger than Pluto and Mercury. • The Galilean Moons are the fifth through eighth closest of the known moons orbiting Jupiter. Io is the closest with Europa, Ganymede, and Callisto outside it. • Io, the closest of the Galilean moons, is the most dense of the moons and is highly volcanic. Its surface is therefore very young. Io’s core is thought to be made up of iron and iron sulphide, there is then a mantle of igneous rocks, the viscous upper layer of the mantle then the outer crust of the moon. This composition is similar to the inner planets. Formed at about the same time as Jupiter it has an orbital radius of around 260,000 miles. • Europa, the smallest of the Galilean moons, orbits outside Io. Europa is thought to be the ocean planet, with a vast watery ocean lying under a crust of ice. It is speculated that the gravitational effects of Jupiter create tides that in turn warm the water. The composition of Europa presents the highest probability for the discovery of life as we know it in the solar system. The Hubble Space Telescope has recorded huge spouts of water vapour jetting from the surface. The moon orbits at just over 415,000 miles from Jupiter. • Ganymede is the next moon out orbiting at over 660,000 miles. It is the largest known moon in the Solar System, almost double the size of Earth’s Moon. It is composed of silicate rocks (similar to Earth) and water ice. Ganymede has a small ferrous core that generates a magnetic field about 1% the strength of the Earth’s. The surface of this moon is old and pockmarked with craters from impacts. In 2015 the Hubble Space Telescope found evidence that there may be a huge underground ocean containing more water than Earth. • Callisto is the furthest out of the Galilean moons orbiting at about 1.1 million miles. The surface of Callisto is the oldest in the Solar System, it also has the most cratered body in the solar system. The implication of this is that there is no volcanic or teutonic activity on the moon which renews the surface. The moon is thought to have a small rocky core and has been proven to contain water ice, carbon dioxide, silicates and organic compounds. It is believed that underneath a 124 mile thick crust lies a salt water ocean some six miles deep. • Possibly the least known fact about Jupiter is that it has rings. In fact there are 3 rings which orbit inside the Galilean moons. These are known as the halo, the main ring, and two gossamer rings from inner to outside. It is believed that the rings are made of small dust particles, not ice. The space probe Galileo confirmed that the main ring was formed from deposits from the inner moons Adrastea and Metis, the two closest moons of Jupiter. The gossamer rings from the small moons Amalthea and Thebe. The rings were first discovered in 1979 by the Voyager 1 spacecraft. They are so faint that they can only be seen looking through them towards the Sun.